jail in 1917. Later that same year he was arrested again, this time for making 'speeches calculated to cause disaffection' and was sentenced to one year hard labour at Mountjoy Prison. He demanded, along with other Republicans in the jail, to be treated as a prisoner of war. When these demands were refused, the prisoners went on hunger strike. 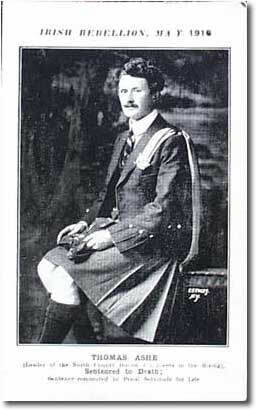 Thomas Ashe died 25 September, 1917, as a result of incorrectly administered forcible feeding. 30,000 people marched in his funeral procession, led by Irish Volunteers in uniform. Eamonn Ceannt was born in Glennamaddy, County Galway on 21 September 1881, but is raised and educated in Dublin as son of a constable of the Royal Irish Constabulary (RIC). After finishing his study at the University College Eamonn Ceannt worked for the Treasury Department of the Dublin Corporation. He was devoted to Irish language, music and dance and in 1900 Eamonn Ceannt joined the Gaelic League. Beside teaching Irish he was an excellent piper who added lustre to a meeting from Irish athletes with the pope. 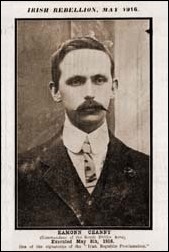 Eamonn Ceannt joined Sinn Féin in 1908 where he came to the attention of Sean Mac Diarmada who recruited him for the Irish Republican Brotherhood (IRB). In the year of its formation Eamonn was appointed to the Provisional Committee of the Irish Volunteer Force (IVF) and acquired the rank of Captain. In this capacity he was involved in the Howth Gun Running. In 1915 Eamonn Ceannt was introduced in the Supreme Council of the Irish Republican Brotherhood (IRB). Although he was not a member of the Military Council of the Republican Brotherhood (IRB) it is assumed that Ceannt was involved in the planning of the Rising of 1916. The fact that he is signatory of the Poblacht na hÉireann also implies involvement in the preparations. During the Easter Rising Eamonn Ceannt was in command of the South Dublin Union and surroundings. Eamonn Ceannt was court-martialled and sentenced to death by firing squad. The verdict was carried out on 8 May 1916 in Kilmainham Gaol. (Tomás Ceannt in Irish)(1865 – 9 May 1916) was an Irish nationalist executed following a gunfight with the Royal Irish Constabulary (RIC) on 22 April 1916. Kent was part of a prominent nationalist family who lived at Bawnard House, Castlelyons, County Cork. They were prepared to take part in the Easter Rising, but when the mobilization order was countermanded, they stayed home. The rising nevertheless went forward in Dublin, and the RIC was sent to arrest well-known sympathizers throughout the country including, but not limited to, known members of the Irish Republican Brotherhood, Sinn Féin, and the Irish Volunteers. When the Kent residence was raided they were met with resistance from Thomas and his brothers Richard, David, and William. A gunfight lasted for four hours, in which an RIC officer, Head Constable William Rowe, was killed and David Kent was seriously wounded. Eventually the Kents were forced to surrender, although Richard made a last minute dash for freedom and was fatally wounded. Thomas and William were tried by court martial on the charge of murdering Head Constable Rowe. William was acquitted, but Thomas was sentenced to death and executed by firing squad in, Cork on 9 May 1916. David Kent was brought to Dublin where he was charged with the same offence, found guilty and sentenced to death, but the sentence was commuted and he was sentenced to five years penal servitude. 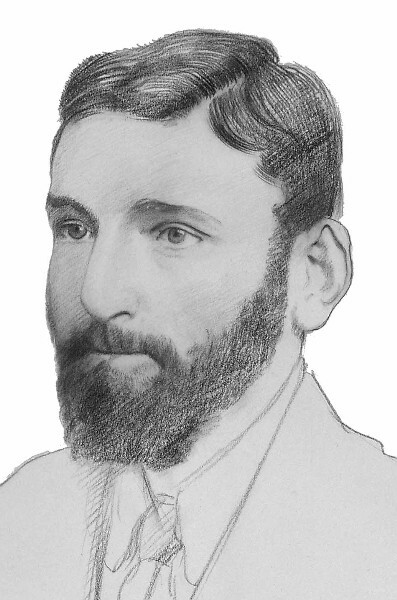 Apart from the singular case of Roger Casement, Thomas Kent was the only person outside of Dublin to be executed for his role in the events of Easter Week. He is buried in the grounds of Collins Barracks, Cork (formerly Victoria Barracks). Born in the Isle of Wight to a Leitrim man and a Tipperary woman his parents eventually settled in Dungannon, Co. Tyrone. Tom emigrated to America to find work at an early age, taking a position as an explosives operative during construction work on Staten Island. As a member of the I.R.B. from the age of 18 Tom was sent to London on their orders to put his new skills to work for their cause. He was captured with a case of liquid explosives and spent fifteen years in Pentonville Prison. Upon his release he married Kathleen, a niece of his old cell mate, John Daly, the Mayor of Limerick. Clarke settled back in America but returned to Dublin in 1907 whereupon he set up a small shop at 75a Parnell Street. This business premises was often used for meetings as he and his new friend, Seán MacDiarmada set about reviving the I.R.B. and planning an uprising. His drooping moustache and quiet manner lent an air of indifference to him but it has been said that the largest file in Dublin Castle was marked Tom Clarke. As the oldest and most respected member of the Military Council Clarke was given the honour of signing the Proclamation first. Cornelius Colbert was born in Athea in Co. Limerick. He was educated in North Richmond St Christian Brothers School after the family moved to Dublin. He secured a job in Kennedy's baker, Parnell Street. He became a pioneer of Fianna Eireann, (Irish National Boy Scott Movement), an organisation so close to his heart that he spent all of his spare time cycling from place to place encouraging people to set up a new sluagh. He joined the Irish Volunteers at its inception and was one of its first drill instructors. He was quickly appointed captain of F Company in the 4th Battalion, a position he held until the rising. Despite his youth, he was an inspiration, and became appointed to Volunteers Headquarters staff. In the years before 1916 he devoted his time to organising the men and boys who were to participate in this historic event. His wages were meagre but he spent almost every penny on the advancement of the movement. Pearse asked him to become a drill instructor at St. Enda's. In spite of his mounting commitments he agreed and when it was suggested that he be put on the payroll he declined and Pearse had to apologise and forget the idea. In the week before the rising Colbert was convinced he was going to die but knew it would not be in vain. He was glad of the opportunity to play his part. He was recognised as a man of high esteem to such an extent that the British soldier who was ordered to pinion him asked for the privilege of shaking his hand. On the 8th of May 1916 Captain Cornelius Colbert was executed in Kilmainham gaol for his part in the Easter Rising. During the rising, it was Connolly who lead the group that entered Dublin Castle, firing the first shot that killed a British soldier, Castle guard James O'Brien. Connolly's men moved from there to take up a position at City Hall, where Connolly himself was shot while attempting to hoist to the top of the City Hall dome the very same green flag that he had used in the play. The first to kill, he became the first of the Rebels to be killed in the Easter Uprising. Edward "Ned" Daly (25 February 1891 – 4 May 1916) was commandant of Dublin's 1st battalion during the Easter Rising of 1916. He was the youngest man to hold that rank, and one of the youngest executed in the aftermath. Limerick-born Daly was the younger brother of Kathleen Clarke, wife of Tom Clarke, and an active member of the Irish Republican Brotherhood. His uncle was John Daly, a prominent republican who had taken part in the Irish Rebellion of 1867. Daly's battalion, stationed in the Four Courts and areas to the west and north of Dublin center, saw the most intense fighting of the rising. He surrendered his battalion on 29 April. In his trial, he claimed that he was just following orders, but was executed by firing squad on 4 May 1916, at the age of 25. The men in his battalion spoke of him as a good commandant. This opinion was also shared by a British officer that Daly's battalion had captured. 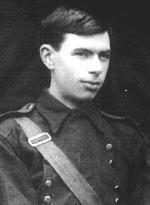 Seán Heuston (1891-1916) was born at 24 Lower Gloucester Street, Dublin, the son of John Heuston, a clerk, and Maria McDonald. He was educated to intermediate grade by the Christian Brothers at O’Connell’s Schools on North Richmond Street. At the age of seventeen he joined the Great Southern and Western Railway Company as a clerk and was stationed in Limerick for six years. He joined Fianna Éireann, the scouting club for boys revived by Bulmer Hobson and Countess Markievicz in August 1909. He organised an extremely active branch in Limerick which eventually had a membership of 250 boys. He devoted most of his spare time to the organisation: lecturing, drilling, marching and promoting a high level of proficiency in the boys under his command. In 1913 he was transferred to Dublin by the GSWR and assigned to the traffic manager’s office at Kingsbridge railway station (now Heuston station). He continued his work with Fianna Éireann where he met Con Colbert and Liam Mellows, both prominent in the organisation. He was given command of a branch in the north side of the city based in Hardwick Hall. He was promoted vice-commandant of the Dublin Brigade and also became director of training. Colbert and Patrick Pearse engaged him for Saint Enda’s, where he provided training in drill and musketry for the students. On the occasion of the landing of arms at Howth in July 1914, he led a contingent of Fianna, bringing a consignment of guns safely back to Dublin in a trek-cart. Heuston joined the Irish Volunteers soon after their formation in November 1913, eventually becoming a captain in Ned Daly’s 1st Battalion. He worked hard with his company, organising marches and field manoeuvres, fostering a spirit of commitment and camaraderie, and procuring arms and equipment by purchase and any other means at his disposal. On Easter Monday he was assigned command at the Mendicity Institution, a building on the south side of the river Liffey, to the west of the Four Courts where Daly and the 1st Battalion were based. Heuston’s function was to control the route between the Royal Barracks (later Collins Barracks, now the National Museum of Ireland) and the Four Courts for some hours so that Daly and the remainder of the 1st Battalion would have time to settle in. In the event, Heuston and his force of less than 30 men held out for over two days. Surrounded and in a hopeless situation, Heuston surrendered on Wednesday to save the lives of his men. Seán Heuston was tried by court-martial and sentenced to death. He was executed on 8 May. At twenty-five years and two months, he was the youngest of those executed. Between 3.45 and 4.05am on 8 May 1916, Sean Heuston was shot in the former stonebreakers yard at Kilmainham Prison. His remains were later buried in Arbour Lane Cemetery. He was unmarried. He was survived by his mother and his brother Michael, then a student for the priesthood at the Dominican Priory, Tallaght. 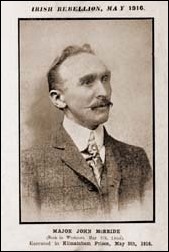 Major John MacBride (sometimes mistranscribed as McBride) (7 May 1865 – 5 May 1916) was an Irish republican executed for his leading role in the 1916 Easter Rising. John MacBride was born was born at The Quay, Westport, County Mayo, Ireland to Patrick MacBride, a shopkeeper and trader, and the former Honoria Gill, who survived her son . He was educated at the Christian Brothers' School, Westport and at St. Malachy's College, Belfast. He worked for a period in a drapery shop in Castlerea, County Roscommon. He had studied medicine, but gave it up and began working with a chemist firm in Dublin. He joined the Irish Republican Brotherhood and was associated with Michael Cusack in the early days of the Gaelic Athletic Association. He also joined the Celtic Literary Society through which he came to know Arthur Griffith who was to remain a friend and influence throughout his life. Beginning in 1893, MacBride was termed a "dangerous nationalist" by the British government. In 1896 he went to the United States on behalf of the IRB. On his return he emigrated to South Africa. He took part in the Second Boer War, where he raised the Irish Transvaal Brigade. Despite being known as MacBride's Brigade its first commander was in fact an Irish-American, colonel John Blake, an ex-US Cavalry Officer. The Brigade was given official recognition by the Boer Government, the commissions of the Brigade's officers were signed by State Secretary FW Reitz. He was commissioned with the rank of major in the Boer army and given Boer citizenship. 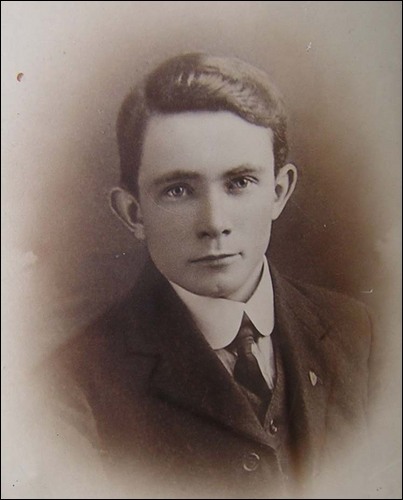 MacBride, unlike the other Rising leaders, was not a member of the Irish Volunteers, and happened to find himself in the midst of the Rising without notice, but he offered his services to Thomas MacDonagh and was appointed second-in-command at the Jacob's factory. MacBride, after a court martial under the Defence of The Realms Acts, was shot by British troops in Kilmainham Jail, Dublin. 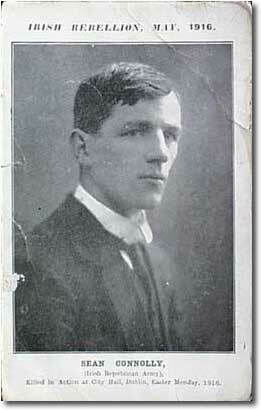 Kilmainham JailHe was executed on 5 May 1916, two days before his fifty-first birthday. Facing the British firing squad, he refused to be blindfolded, saying "I have looked down the muzzles of too many guns in the South African war to fear death and now please carry out your sentence." He is now buried in Arbour Hill Cemetery (Dublin). 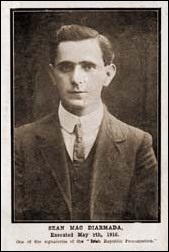 Sean MacDiarmada was born in Leitrim and in his youth worked as a gardener and tram conductor. Later, in Belfast, he was sworn into the Irish Republican Brotherhood. In 1908 he was transferred to Dublin, where he developed a close personal and political friendship with Thomas Clarke. From this time onwards he was unrelenting in his organisation of the IRB and through his travels across Ireland became the movement's best-known and most popular personality. 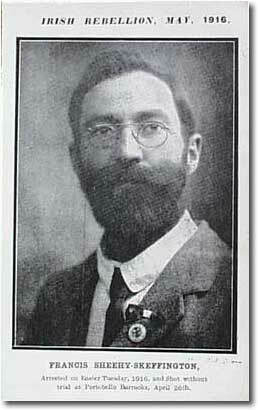 He was one of the founding members of the Irish Volunteers in 1913 and was Secretary of the Supreme Council of the IRB. He was a member of the Provisional Government and signatory to the 1916 Proclamation. He was executed for his part in the Easter Rising. 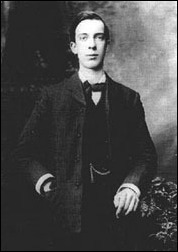 Thomas MacDonagh (1 February 1878 – 3 May 1916) was an Irish nationalist, poet, playwright, and a leader of the 1916 Easter Rising. MacDonagh was born in Cloughjordan, County Tipperary. Throughout his life he had a keen interest in Irish heritage and the Irish language. He moved to Dublin where he joined the Gaelic League, soon establishing strong friendships with such men as Eoin MacNeill and Patrick Pearse. His friendship with Pearse and his love of Irish led him to join the staff of Pearse's bilingual St. Enda's School upon its establishment in 1908, taking the role of teacher and Assistant Headmaster. He also founded the teachers' trade union ASTI (Association of Secondary Teachers in Ireland). 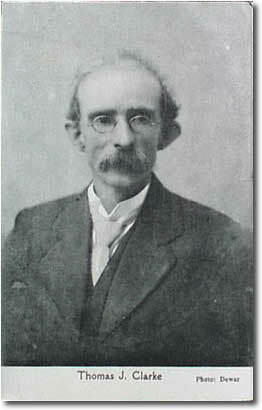 Though MacDonagh was essential to the school's early success, he soon moved on to take the position of lecturer in English at the National University. MacDonagh remained devoted to the Irish language, and in 1910 he became tutor to a younger member of the Gaelic League, Joseph Plunkett. The two were both poets with an interest in the Irish Theatre, and formed a lifelong friendship. Though credited as one of the Easter Rising's seven leaders, MacDonagh was a late addition to that group. He didn't join the secret Military Council that planned the rising until April 1916, weeks before the rising took place. The reason for his admittance at such a late date is uncertain. Still a relative newcomer to the IRB, men such as Clarke may have been hesitant to elevate him to such a high position too soon, which raises the question as to why he should be admitted at all. His close ties to Pearse and Plunkett may have been the cause, as well as his position as commandant of the Dublin Brigade (though his position as such would later be superseded by James Connolly as commandant-general of the Dublin division). Nevertheless, MacDonagh was a signatory of the Proclamation of the Republic. During the rising, MacDonagh's battalion was stationed at the massive complex of Jacob's Biscuit Factory. On the way to this destination the battalion encountered the veteran Fenian, John MacBride, who on the spot joined the battalion as second-in-command, and in fact took over much of the command throughout Easter Week, although he had had no prior knowledge and was in the area by accident. As it was, despite MacDonagh's rank and the fact that he commanded one of the strongest battalions, they saw little fighting, as the British Army easily circumvented the factory as they established positions in central Dublin. MacDonagh received the order to surrender on April 30, though his entire battalion was fully prepared to continue the engagement. 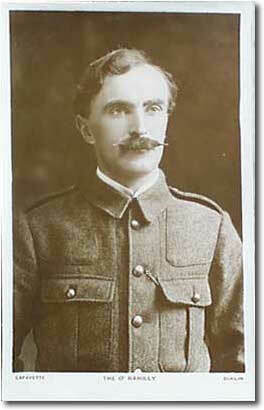 Following the surrender, MacDonagh was court martialled, and executed by firing squad on 3 May 1916, aged thirty-eight. MacDonagh was generally credited with being one of the most gregarious and personable of the rising's leaders. (President Irish Volunteers, Sentenced by Courtmartial to Penal Servitude for Life. The official leader of the Irish Volunteers was Eoin MacNeill, a distinguished academic and cofounder of the Gaelic League. He believed that the Volunteers should only resort to violence if the government threatened to disarm them, and upon being informed that an actual armed uprising was to take place over the Easter weekend, refused to sanction it. When he learned that, in fact, the British government was planning to disarm the Irish Volunteers and the Irish Citizen Army after the holiday weekend, he agreed the rising should go ahead... but once again withdrew his support upon learning that Roger Casement, who was attempting to land a boatload of arms from Germany, had been captured by the British over the weekend. Concerned with the inevitable loss of life in what seemed a hopeless cause, MacNeill decided to do everything in his power to stop the armed rebellion and took out an ad in the Sunday Independent cancelling the scheduled 'manoeuvres'. Little is known about Michael Mallin. He was born in Dublin in 1874 and earned a living as silk weaver and shop owner. In 1909 Michael Mallin became Secretary of the Silk Weavers Union. The shop went out of business in 1913. Michael Mallin found a new job in the Irish Transport and General Workers Union (ITGWU) as band instructor. Michael drew James Connelly's attention when these bands were included in the Irish Citizens Army (ICA) and he became drill instructor. 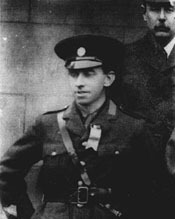 At the time of the Easter Rising Michael Mallin was the second in command of the Irish Citizens Army (ICA). According his own statement Michael Mallin was not informed about an upcoming rising. James Connolly ordered him on Easter Monday to go to Saint Stephens Green with 36 men and report at the officer of the Irish Volunteer Force (IVF) there. Soon after he had arrived the shooting began and Countess Markievicz made him the commanding officer of Saint Stephens Green. In no-time the serene city park was transformed in a wasteland with hasty raised barricades of motorcycles and criss-cross dug trenches. Remarkably they did not made attempts to seize the buildings. Although one might question Mallin's statement it is apparent that there were no plans for occupying and defending Saint Stephens Green. For those unfamiliar with the situation: Saint Stephens Green is a real city park, with several access roads and enclosed by buildings. It is simply impossible to keep such location without controlling the buildings. Not surprising that Saint Stephens Green was the first stronghold to collapse on the third day of the Rising, forcing the Republicans to withdraw in the adjacent Royal College of Surgeons. Michael Mallin refused to abandon the Royal College of Surgeons. 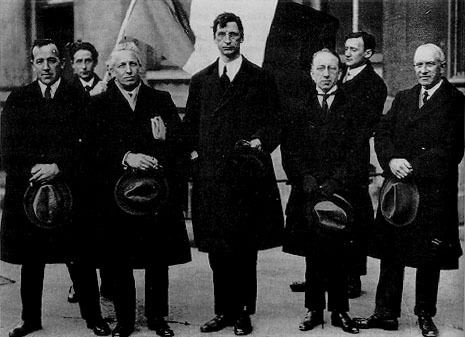 It took a direct order from James Connelly to persuade Michael Mallin to surrender on Sunday 30 April, two days after Pádraig Pearse and James Connolly. 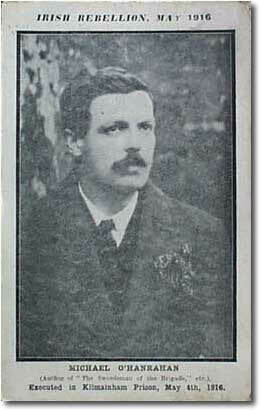 Michael Mallin was executed on 8 May 1916 in Kilmainham Gaol. which he bequeathed the copyright to his novel 'A Swordsman of the Brigade'. The book was published posthumously. 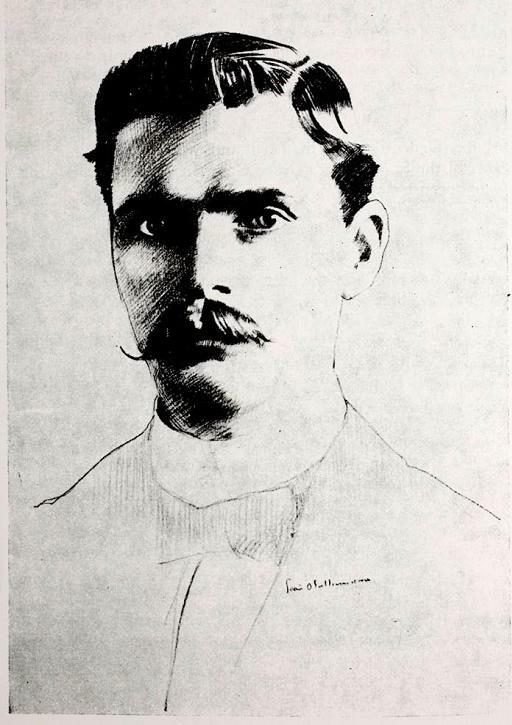 Michael O'Rahilly was the first of the actual leaders of the Rebellion to die and the only one killed in action. 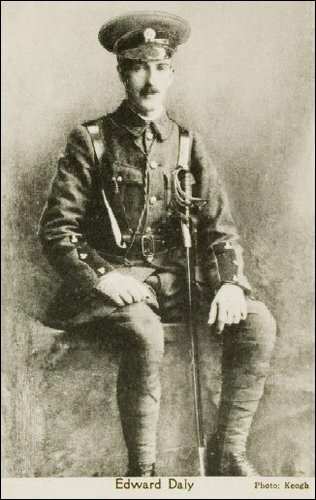 Although a founding member of the Irish Volunteers who believed that armed revolt was the only way to end British rule in Ireland, he opposed the timing of the Easter Rising but felt honour bound to participate once it had started, deciding that 'having helped to wind the clock he must come to hear it strike'. When fires in the GPO became unbearable, The O'Rahilly led a group in a charge up Moore Street and got as far as the corner of Ridley Road and Moore Lane when he was shot. Crawling to a nearby doorway he had time to write a final note to his wife Hannah, who he left behind, along with three sons. 'It was a good fight anyhow,' he said. In November 1913 Pearse was invited to the inaugural meeting of the Irish Volunteers, formed to enforce the implementation of Westminster's Home Rule Act in the face of opposition from the Ulster Volunteers. The bill had just failed to pass the House of Lords at the third effort, but the diminished power of the Lords under the Parliament Act meant that the bill was only to be delayed. Early in 1914, Pearse became a member of the secret Irish Republican Brotherhood, an organisation dedicated to the overthrow of British rule in Ireland and its replacement with a Republic. 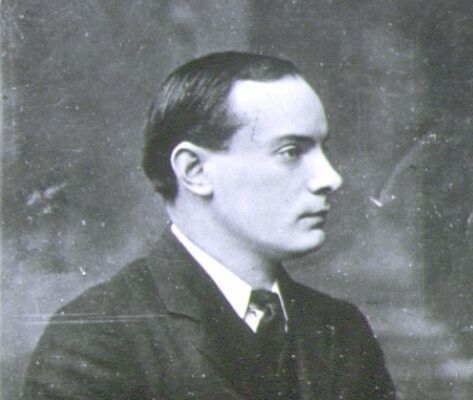 Pearse was then one of many people who were members of both the IRB and the Volunteers. When he became the Volunteers' Director of Military Organisation in 1914 he was the highest ranking Volunteer in the IRB membership, and instrumental in the latter's commandeering of the Volunteers for the purpose of rebellion. By 1915 he was on the IRB's Supreme Council, and its secret Military Council, the core group that began planning for a rising while World War I raged on the European mainland. On 1 August 1915, Pearse gave a now-famous graveside oration at the funeral of the Fenian Jeremiah O'Donovan Rossa. It closed with the words: "Our foes are strong and wise and wary; but, strong and wise and wary as they are, they cannot undo the miracles of God Who ripens in the hearts of young men the seeds sown by the young men of a former generation. And the seeds sown by the young men of '65 and '67 are coming to their miraculous ripening today. Rulers and Defenders of the Realm had need to be wary if they would guard against such processes. Life springs from death; and from the graves of patriot men and women spring living nations. The Defenders of this Realm have worked well in secret and in the open. They think that they have pacified Ireland. They think that they have purchased half of us and intimidated the other half. They think that they have foreseen everything, think that they have provided against everything; but, the fools, the fools, the fools! — They have left us our Fenian dead, and while Ireland holds these graves, Ireland unfree shall never be at peace." For more info on Padraig Pearse, click here. 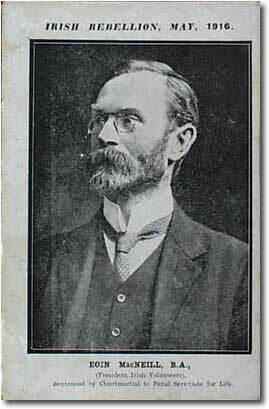 William James Pearse was born in 1881 as the younger brother of Pádraic Pearse. The two brothers developed a close, but somewhat unbalanced, friendship in which William was completely devoted to Pádraic. In this respect the brothers Pearse can be compared with the Emmet brothers Thomas and Robert. Initially William Willie Pearse followed in his father's, a monumental sculptor, footsteps and was educated at the Dublin School of Arts and in Paris. In 1908 William Pearse left the workshop of his father to become a teacher at Pádraic's Scoil Éanna, or Saint Enda's School, and would eventually disappear in the shadow of his brother. Like his brother William was a founding member of the Irish Volunteer Force (IVF) and member of the Irish Republican Brotherhood (IRB). When Pádraic Pearse became more and more involved in the Irish Republican Brotherhood (IRB) William took over the day-to-day routine at Saint Enda's. William never achieved a rank of significance in none of the organisations, nor was he member of the Military Council of the Irish Republican Brotherhood (IRB). On Easter Monday 1916 William Pearse joined his brother to the General Post Office (GPO) and stood beside Pádraic when he proclaimed the Poblacht na hÉireann, Irish Republic. The rank of William during the Easter Rising is disputed. According to some he was an officer, while the British General Sir John Maxwell described William as acting as an officer. Although William pleaded guilty he stated that he was only the personal attaché of his brother without direct command. Probably because of his plead and of course his relation with Pádraic William Pearse was sentenced to death and transferred to Kilmainham Gaol. His request to visit his brother for the last time was granted, but Pádraic was shot at the moment William was on his way to the cell. William Willie Pearse was shot in the former stone breakers yard of Kilmainham Gaol on 4 May 1916. A keen scholar and the son of a papal count, Joseph Plunkett had the benefit of close ties with the literary world, and has left us with some inciteful poetry. He was a friend of Thomas MacDonagh with whom he worked as director of the Irish Theatre and as co-editor of the Irish Review. Plunkett's house in Kimmage, a suburb of Dublin was used as one of the clearing stations for the cargo of arms landed at Howth in 1914 for the Irish Volunteers. It was also used as a training camp for young men who had been invited by the Plunkett family to Ireland from Britain to avoid conscription during World War One and to fight for an Independent Ireland instead. 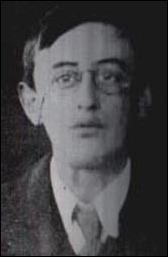 Joseph Plunkett suffered from ill health and had had an operation for glandular tuberculosis only days before the Rebellion, struggling out of his sick bed to partake in it. He was assisted by a young and unknown IRB volunteer who acted as his Aide de Camp, Michael Collins. Joseph Plunkett was a member of the Military Council of the Provisional Government and of the Provisional Committee of the Irish Volunteers. He married his sweetheart, the artist Grace Gifford, in Kilmainham Gaol just hours before his execution. against the 'Sinn Feiners'. At first the British tried to cover up Colthurst's actions but continued protests led to his formal court-martial on June 6th. He was found guilty but insane and incarcerated in Broadmoor Criminal Asylum. Colthurst spent 20 months there, then emigrated to Canada to retire on a military pension. out of the Dail, de Valera made Civil War inevitable.